Maybe you’re asking real questions about God’s ways and someone’s giving you trite answers. Maybe you’ve been hurt by people in your church and you want to walk away. You’re just not that into him. Let me make a suggestion. Stop trying so hard. And, for goodness sake, stop faking it. Instead, ask God to stir your heart to love him. Tell him that you’ve got more questions than answers. Tell him that life is hard, you’re hurting, and you’re worn out. Tell him that you want to love him, but your heart has grown cold. He can take it. He knows it already. And he is ready to lead you into the most deep and satisfying love relationship that you could ever know. Ask God to stir your heart to love him. And keep asking him. I know you have hard days. We all do. Honey, sometimes the hours are long. And then there are those days when just getting through the next minute feels like a miracle. So, what keeps you going? How do you make it to the next minute, and the next, and the next? For me, it’s one simple promise. When the next minute seems so far away, when the affliction seems anything but light and momentary … remember the promise of glory. Regardless of what you feel, rest in the greater truth that this minute is carving out something beautiful, lasting, eternal, without compare. Breathe deep and check the clock to see if the the minute has passed. And keep going. Should You Send the Glitter? This is a cell. As in ribosomes, and mitochondria, and my favorite … endoplasmic reticulum. Not just any cell. A Willy Wonka cell. Piper’s taking 9th grade biology. And for a very special project, she needed to come up with a creative way of depicting a cell. Let me take you a little closer. This may look like a chocolate river to you. But there it is! Endoplasmic reticulum! And what’s that at the end of that multi-colored pathway? Is it a sparkly new TARDIS? An elevator made out of dominoes and covered in glitter? No! It’really cilia and flagella, those cellular bodies responsible for moving stuff around the cell. Get it? But let’s go back to the glitter. I was good with Piper buying mounds of candy. I was okay with her using the hot glue gun. I even let her ruin counting squares and dominoes for her project. But the glitter just about put me over the edge. Who invented the stuff? And how did it get in my house? And why, oh, why have I not gotten rid of the glitter before now? And apparently I’m not the only one who feels a bit bitter toward glitter. There is actually a business, my friend, that will send a glitter bomb to your enemies. For under $10 they will fill a nondescript envelope to the brim with glitter and deliver it right to your enemy’s mailbox. Your enemy will carry this cute envelope into her kitchen and be a bit excited. Because how often do you get a real letter? And then, my friend, she will tear open the envelope and glitter will fly everywhere filling every nook and cranny of her home for days. Sounds kind of cute, right? Kind of funny? But here’s my advice. Don’t send the glitter. It might seem satisfying in the moment. But in the long run, it will leave you feeling pretty empty, pretty awful, pretty bitter. Leave it to God and don’t send the glitter. Do not be overcome by evil, but overcome evil with good. Romans 12:19-21. It was tough for my friend, Juana. It got so tough, that she walked away from her marriage. Seriously. But, rather than tell you her story, I want you to read her story. Juana is so real. And she does something that is absolutely amazing. She shares what she’s thinking, how she’s feeling as she’s contemplating the exit ramp. Contentment is tough. But Paul nails it. 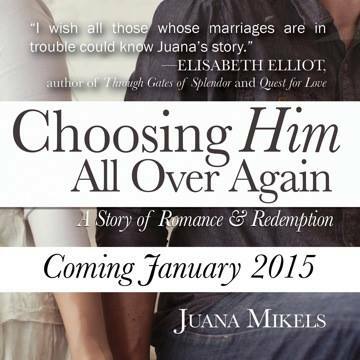 And in Choosing Him All Over Again, Juana nails it too. Juana learned the secret of contentment. And she’s excited to share it with you! David has been appointed and anointed. He’s whipped the Philistines and everyone knew that God was with him. So, when this newly crowned king led a crowd of 30,000 to bring home the ark of God, nobody batted an eye. After all, he was king. And he had a history of seeking God, and hearing from him. Except this time … he didn’t. David’s vision was glorious. More than anything, David wanted God’s presence with him and with the people. He wanted to bring home the ark of the covenant. But, he didn’t do his homework. This ark was so special that God had specifically told Moses how the ark was to be carried. David didn’t do his homework. Or he ignored it. Two men, Uzzah and Ahio, loaded the ark of the covenant onto a cart pulled by oxen. As they set out from Baal-judah to Jerusalem, it was a party. And David is loving it. But David allowed his vision to lead, rather than God. Ahio is walking in front of the cart, and Uzzah is toward the back. One of the oxen stumbles. Uzzah did what any of us would do. He put his hand out to keep the ark from falling off. And immediately God strikes him down … dead. The result of David’s pursuit of his glorious vision was death, anger, fear, and a temporary abandonment of the vision. Pursuing a glorious vision is dangerous. But it doesn’t mean the vision is wrong. Rather than abandon your glorious vision, learn from David. Seek God and do your homework. Do you have a glorious vision that you need to bring before the Lord? Are You Holding Onto the Fierce Promise of Christmas? On this side of the new year, resolutions still a bit shiny, it’s easy to relegate the fierce promise of Christmas to the dried up tree by the trash pile. It’s easy to box up the incarnation along with the ornaments and head to the gym. It’s easy to be as weary with the mystery of Emmanuel as you are with rocking’ around the Christmas tree. But, let’s not do that. The fierce promise of Christmas is for today. The whisper of Emmanuel, God with us, threads through the ages and came to a glorious crescendo at the cradle. As Jacob dreamed of stairways and angels. And Moses charged a new generation and a new leader with the promise that should have been his. As Joshua stood on the edge of the Jordan with a band of nomads and an impossible challenge. As David passed the legacy he wanted onto his son. As Haggai stood by a ruined city, with a ruined people calling them with hope and purpose. I will never leave you or forsake you. I am Emmanuel. God made flesh. I am with you always. Whatever today holds, whatever challenges, disappointments, fears you face, would you hold onto the fierce promise of Christmas? It’s for you and me today. … how do you handle it? Yesterday, we all heard the news from Paris. We read of journalists being hunted down for exercising free speech. We watched the video of a wounded police officer being executed. The cold-blooded professionalism of these assassins was chilling, to say the least. I’ve seen people react to terrible things in the world and in their personal life in a variety of ways. ~Some bury their heads in the sand and pretend that the evil is not real. ~Some blame those who are hurting even searching for sin in their lives. ~Some walk away from God directing their anger toward him. A way that will enable you to consider the reality of the pain in this broken, groaning world and respond in a way that brings you peace. 1. Partner with Christ to be a force for good in the world. 2. Pray that those plotting evil would be stopped, and that those who have done evil will be brought to justice. 3. Press more deeply into the Word to understand Christ’s will and his ways. 4. Practice the presence of God through prayer, meditation, and watching for his fingerprints . 5. Pursue the long vision by trusting in the hope of Christ’s return and his promise that a better day is coming. 6. Pray for those being hurt by evil, and if you have the capacity, do what you can to come alongside. Terrible things are part of this fallen, broken world. Creation groans. But let’s choose to not bury, blame, or walk away from God. Let’s choose a better way. Today is my daughter, Grace’s, birthday. And I’m missing her. This morning she’s waking up nearly four hours away, and I’m sad. This launching thing is tough on moms. So, today, although she’s not with me, I’m holding Grace. I’m thinking of her birth that came nearly 8 weeks early. She was so tiny. Such a little something. She was healthy, just little. Those days of skin to skin, in the darkened NICU were so precious. Just holding Grace. I’m missing her today. And as I’m thinking about her, I know I can never really hold grace. Grace is too big, too bold, too audacious for me to hold. Grace upon grace, upon grace, upon grace. Just like my daughter rushed into my life, a bit early, a bit fast, a bit overwhelming, grace overwhelms. Grace upon grace. I can’t hold it. None of us can. Awe-inspiring, lavish, love-saturated grace. And so while I marvel at the grace of this precious daughter of mine, would you join me in marveling at God’s grace? Would you leave a favorite grace-filled verse in the comments? Holding grace is not possible. But celebrating it is. Nehemiah and friends had a job to do. Build the wall. Their focus was singular. Their objective was clear. Build the wall. But an outside enemy threatened. He raged and fumed and mocked their work. In a sick kind of partnership, former enemies became partners and joined in the taunting. Nehemiah and friends prayed. And then they got back to work. Build the wall. But more enemies rallied, angry and plotting confusion. The outside threat was real. But then the threat moved closer to home. Friends and family asked them to leave the wall. But, in the face of opposition, Nehemiah did a beautiful thing. He shifted their perspective, lifted their gaze. Now it wasn’t just about brick and mortar. It wasn’t just about the wall. It was for God’s glory, for family, and for a future. Maybe an outside enemy is threatening you. Or you have friends and family who are encouraging you to leave the work and just come home. Lift your eyes above the bricks and mortar, and remember the Lord. Remember why it is that you are doing what you are doing. This could change everything. Honestly, I want her to grow up and do what she wants. Growing up, really growing up, doesn’t mean that we get to eat what we want, stay up late, or climb trees in the rain. Growing up means that, above all, we want what God wants. Time and time again, the word of the Lord came to Ezekiel. He craved God’s voice. And when God spoke, he obeyed, no matter what. He knew that his deepest satisfaction would be found in hearing and obeying God’s voice.